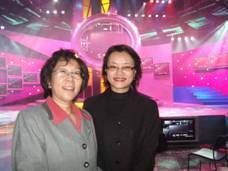 Invited by the State Intelligence Property Office (SIPO), Cathy Huang, the General Manager of China Bridge International flied to Beijing in early December, 2005. 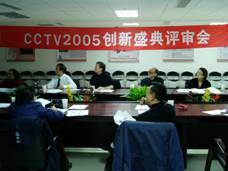 She was one of the judges for CCTV 2005 Grand Ceremony of Innovation. Jointly organized by CCTV and SIPO, CCTV 2005 Grand Ceremony of Innovation is the successor of CCTV 2004 Innovation Night. 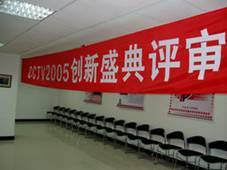 As the first award ceremony with the emphasis of innovation in Asia, CCTV 2005 Grand Ceremony is deemed to exert great influence to the whole Asia-Pacific region. It attracted more than 1000 entries from 100+ famous companies around Asia, covering digital equipment, cell phone, automobile, PC and home appliance. The organizers set up 4 major awards, namely, Best Appearance, Best Function, Best Design and Top Innovation. "Vote through Internet + Judge Panel" is the way to choose the final winners for the grand event. 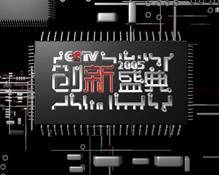 All the outcomes will be shown in the Grand Ceremony of Innovation on CCTV 2, Jan.2, 2006. With the intention to apply the innovative and practical scientific products into the daily life, CCTV 2005 Grand Ceremony of Innovation not only focused on the current popular products but also those with futuristic features. The judge panel was powerful and authoritative, consisting of experts from SIPO, CCTV, design organizations, universities and media, like the whole iF design award judge panel, editors of TIME, Fortune, etc. For these distinguished experts, the judge job was anything but an easy one. Facing more than 1000 entries, they felt hard to finish the shortlist. Some of the entries were much impressive. Nokia's N92 boasted of the Mobile TV function with high resolution and it's recognized as the trend of future cell phone. Meanwhile, the domestic companies presented products which were equally excellent, e.g. Amoisonic and Haier launched well-designed cell phones, but also eye-catching laptops and home appliances. Many of the judge panel acknowledged that Made-in-China products gradually shook off the influence of international big names and stepped onto the way of "Created in China".